If it’s Friday, it’s Handbuilt Holiday. 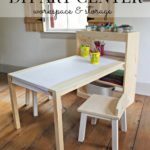 This is Week 3 of the 2017 series and Ana White and I are bringing you this modern house shaped desk perfect for kids and adults. 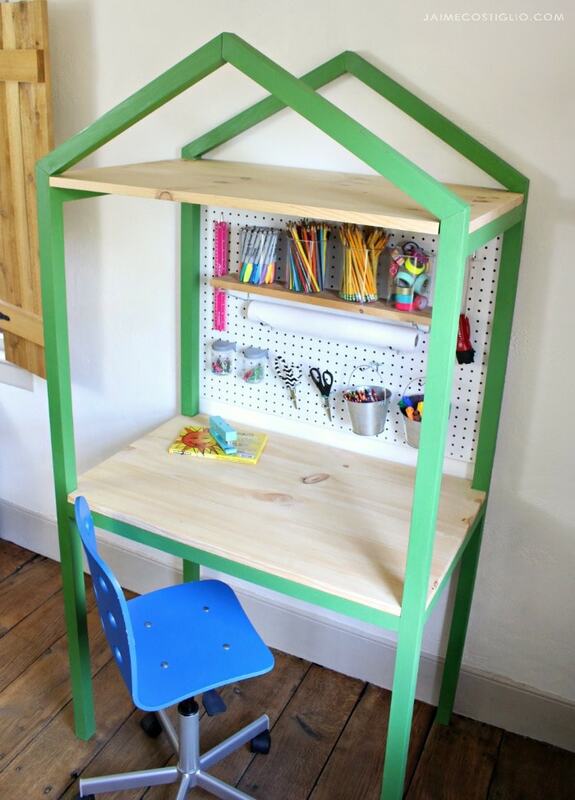 Build a modern house shaped desk perfect for kids and adults. It’s Week 3 of the Handbuilt Holiday series and we have free plans to share with you. 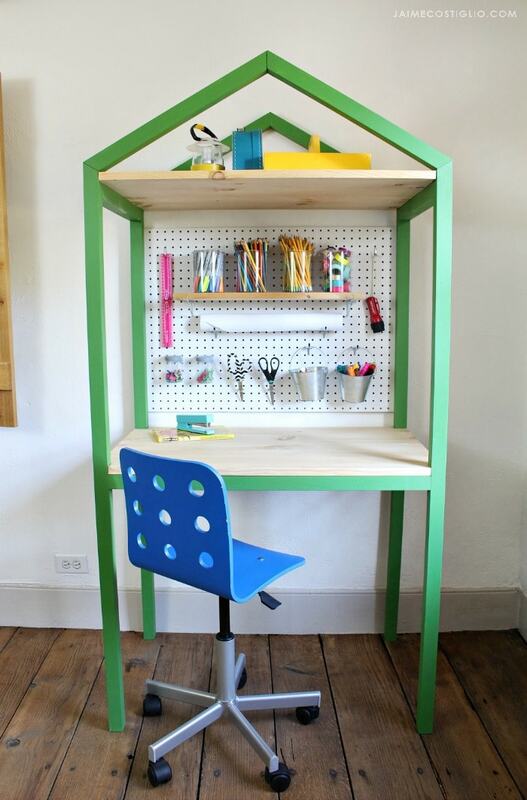 Create this dedicated workspace with storage using simple furniture construction and free plans designed by Ana. 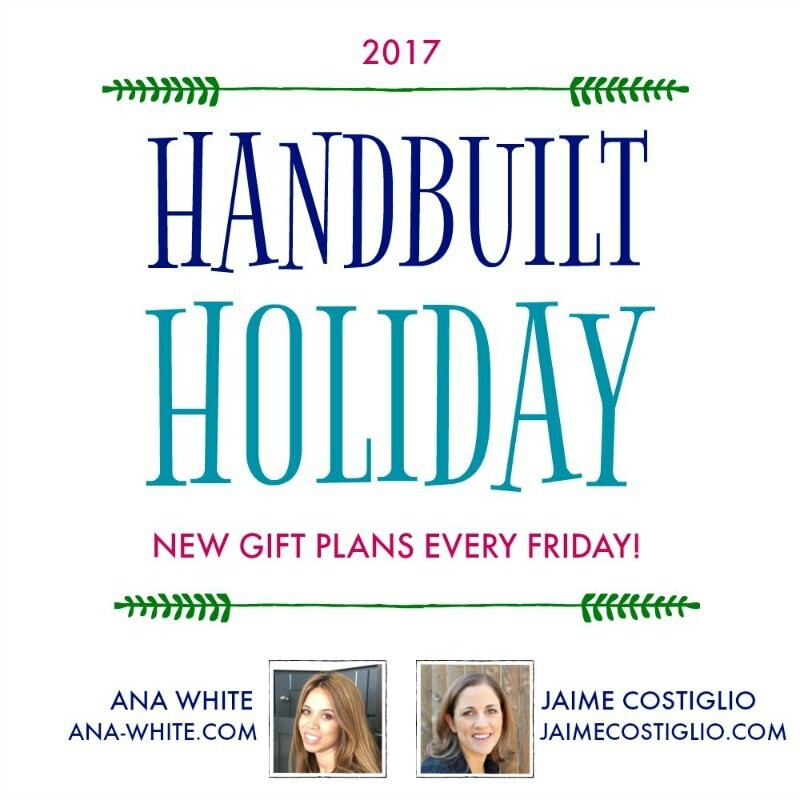 Our goal is to share a new gift build plan every Friday until Christmas. 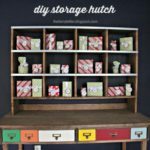 We’ve been doing the Handbuilt Holiday series for 5 years now so if you’re looking to build a holiday gift for that special someone be sure to search through the previous years projects here. This modern house shaped desk is full of clean lines, a large open workspace and a large upper storage shelf. I added a piece of pegboard almost exactly as it comes from the store, only making one cut to the length then attaching it from the back and presto you have a whole wall full of storage possibilities. 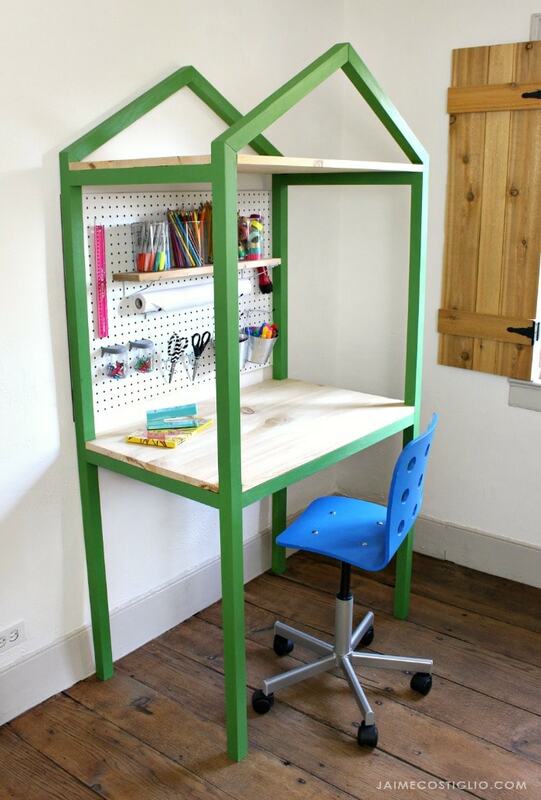 Ana has the free plans here to build this modern house shaped desk. 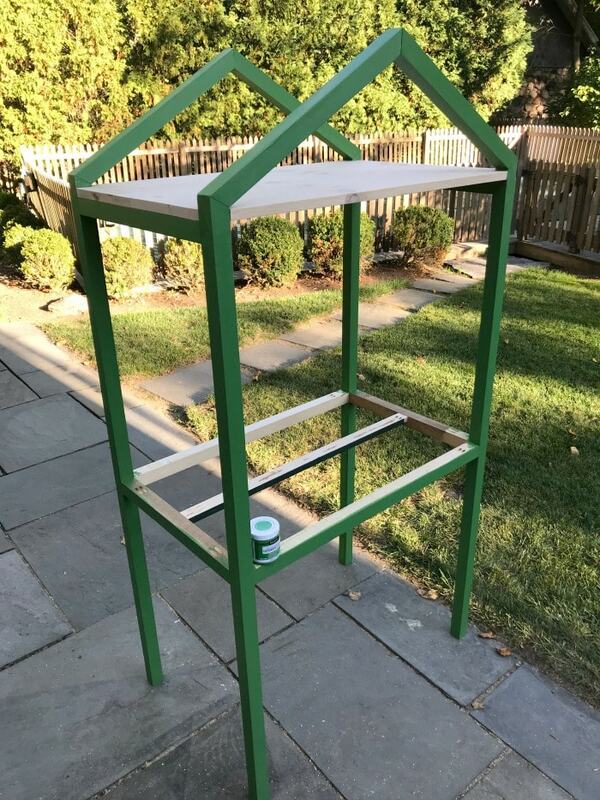 I finished the frame using DecoArt Americana outdoor living paint in Lilypad. The desk and shelf panels are sealed with clear satin poly. Now get building all those holiday gifts and you’ll be ready when the big day rolls around! Love this. I’m not sure if its just me, but the link doesn’t take me to the plans for this?? is there another way to get them? Thank you so much Jaime!! I will be needing to make two of these for Christmas I think. 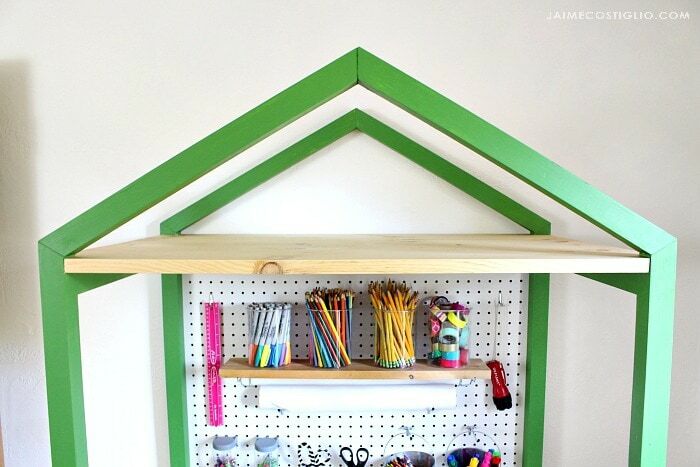 What is the exact size of that pegboard and when it comes time to get those top braces on top, that hold that top shelf…how far down did you measure? just the depth of the board that is going in? What is the measurement of that cross piece for the desk….aaannnnnndddddd…. The actual desk and top shelf. Since you used 2 pieces of 1 x 12 that should probably only equal 22 1/2. (i think ours are 11 1/4″ for a 1 x 12.) 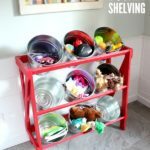 Did you adjust the cross pieces to accomodate those shelves? sorry for all the questions. 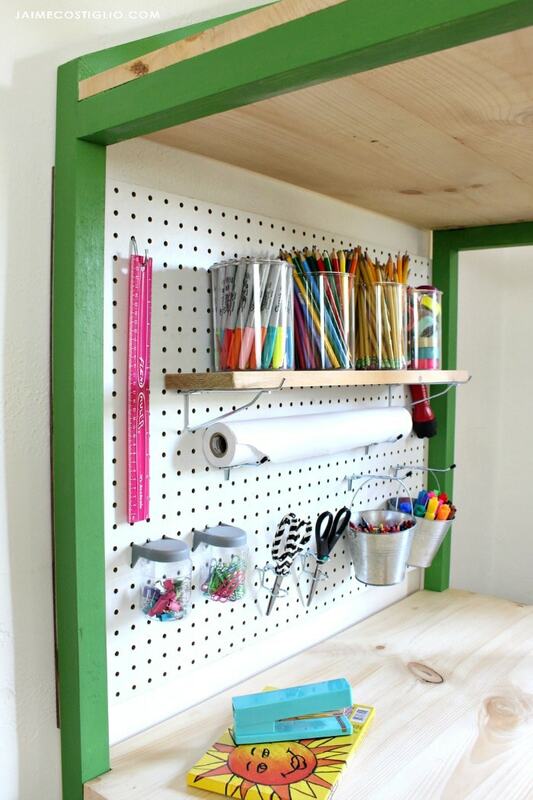 The pegboard comes as a project panel (2′ x 4′) but I cut it down to 36″ x 24″. I believe the top braces are 58 1/4″ from the floor (step 2 in Ana’s plans). Cross piece for the desk – do you mean the center support I added? It’s a 1×2 @ 33″. The desk top and shelf are 36″w x 22 1/2″d so yes that makes the side supports 3/4″ shorter or 19 1/2″ (instead of 20 1/4″). Hope that helps, good luck with your desks! This looks great! I wonder if it would also work to locate the paper roll on the side for easy access . . .
Looks awesome! Where do you put the pocket holes on the angle boards (e.g. inside the angle, outside the angle, on the back)? Thanks! Thanks Chuck. On the top angled pieces I put the pocket holes on the back and perpendicular to the cut end. That means the pocket hole will ‘eat’ into the side of your board but I just fill with a plug and trim flush.